This is a �Great Recording of the Century� if ever there was one. Recorded more than forty years ago it sounds as fresh as ever and, honestly, so much has been written about these readings that there is very little to add. I don�t know about the sales figures but I suspect that there must be a worn LP or a CD in practically every music-lover�s collection. Those few who have resisted earlier bets should definitely hasten to the nearest record store now, especially since this latest incarnation also includes Sir John�s sparkling version of Cockaigne for good measure. With rasping trombones, blazing trumpets and the Philharmonia strings velvety but incisive this is as ebullient a reading as one can come across; a charming picture postcard of Edwardian London. It wouldn�t be Barbirolli if he didn�t linger lovingly over the lyrical pages. First and foremost, though, this is carefree and jolly music � Elgar at his most outgoing. But of course it is for the other two works that most people will want this disc. 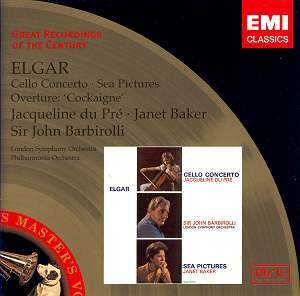 Today Elgar�s Cello Concerto is a standard work in concert halls around the world, challenging even the Schumann and Dvoř�k concertos. I believe that this is to a certain extent thanks to the present recording. From the very start one can feel the almost transcendental rapport between the young soloist, barely turned twenty, and the ageing maestro. One can dip into the recording at almost any point and feel the magic. Take the opening of the third movement which is played with such simplicity that it feels like sacrilege even to breathe. Try also 9:10 in the last movement where the LSO strings swell so unforgettably. There is an inevitability about the whole performance that is not easy to analyse or rather, as with most great works of art, analysis often tends to obscure instead of clarify wherein the greatness lies. Why is Mona Lisa such an undisputed masterpiece? Both the painting and this recording go directly to the heart. And that is exactly what Janet Baker�s singing of Sea Pictures also does. Back in the early 1970s I first heard Where Corals Lie on a Janet Baker sampler LP. I have long since lost count of how many times we played this song. Later, when we found out that it was actually part of a song-cycle, we enlarged our collection and found that the song made an even greater impression in its rightful setting. It is so magically performed here. It ranges from the frail Sea Slumber Song via the serene beauty of In Haven to the sacred solemnity of Sabbath Morning at Sea and the powerfully dramatic declamation of The Swimmer, all backed up by a Wagnerian orchestra. The purity of tone is amazing, absolutely even from top to bottom, from the hushed pianissimo to the full-voiced final pages of Sabbath Morning and most of the Swimmer. Behind and above Jacqueline du Pr� and Janet Baker looms Sir John�s spirit, loving and sensitive. Yes, indeed: Among the many jewels in the GROC series this one shines possibly brighter than any of the others.